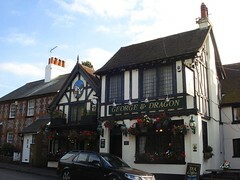 Pub in Downe (a small village-like area in the London Borough of Bromley). It's divided into two parts internally. To the right is a more traditional pub area, with dark wood panelling, a patterned carpet, and terracotta tiling around the bar. The low ceiling has exposed beams decorated with horse brasses and dried hops (and fairy lights, though these were switched off on our visit). Various pictures and prints hang on the walls, including a drawing of the pub and an old map of Surrey, Sussex, and Kent. As well as normal chairs and tables there are a couple of banquettes, with large comfy cushions piled against the wooden banks. The left-hand side extends back as a separate restaurant area, with a little sofa corner in front of it. Finally, there are a few picnic benches running along the exterior side wall of the pub. Kake visited on a Tuesday early evening in September 2012. There were four real ales on: Harvey's Sussex Best (£1.75/half), London Pride, Timothy Taylor Landlord, and one other that my notes neglect to mention. There were four customers in when I arrived around 4pm, all standing or sitting at the bar, and a couple of others turned up while I was there. Music was playing, not too loud, a bit MOR. Accessibility: A small step and then a larger step to get in. There's another step in the middle of the pub side, on the way to the toilets. Last visited by Kake, September 2012. Page last edited 2012-09-05 17:05:19 (version 1).